Providing the “ultimate escape” All Star Lanes have recently expanded their offering of classic American boutique bowling lanes. All Star Lanes are established as a boutique bowling company and as Fusion By Design have been working with them on several recent projects, we were asked to continue this relationship to develop their largest project to date. 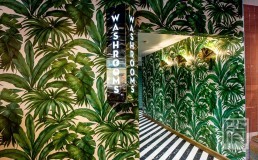 Our brief was to provide the interior design for their newest venue within the extension of the Westfield shopping centre, a 16,910 sq.ft boutique venue which features two Art Deco inspired cocktail lounges, 10 state-of-the-art bowling lanes, a private event room and a heated outdoor terrace. It was outlined from the start that the new venue would need to take a more upmarket direction than some of their other sites as this would better suit the west London location. The ASL brand has a mid-century American heritage that is the key to the company’s ethos and it was important to maintain this but with a more stylish approach. We developed a concept scheme that drew heavily on Art Deco Americana, specifically thinking about 1930’s Miami; The strong shapes and patterns and the soft pastel shades of this era. The client was keen that we encouraged the customer to use this fantastic corner of the Westfield development not just for bowling, but for a variety of social occasions. The main bowling area is located centrally to the site and has 8 lanes, alongside a secondary bar and 2 private karaoke rooms. 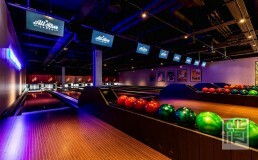 The rear of the venue houses the private lanes room which includes a private bar and two bowling lanes as well as a substantial seating and lounge area. The venue has two entrances. The main one is off the new central square to the Westfield extension. A pergola covers the outdoor seating and large bi fold doors usher the guests into the main bar area. Bespoke Art Deco inspired fret cut screens provide privacy to those in the bar, the bar front is clad in green marble and with brass over storage and large comfortable bar stools this is a great place to sit, order a cocktail and grab a view out to the square beyond. The lounge opposite the bar features relaxed and comfortable seating, surrounded by walls clad in simplistic shades and textures of white and soft grey. We developed a bespoke soft pink art deco inspired pendant light which features over the tables of the fixed seating to the perimeter of the bar and dining area. 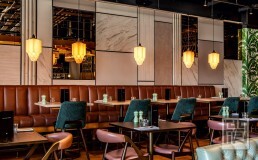 The bar and dining areas feature a colour palette of soft pinks and greens, with bespoke dyed leathers to the surrounding fixed seating benches and feature chairs. The central area of the venue provides another bar counter which is more lightly finished in white marble effect cladding. This is the location of the secondary entrance for the dedicated bowlers coming to the lanes. The area features fret cut metal screens which break the spaces up and are softened by interior planting to add to the relax Miami style atmosphere. The reception counter is clad in a encaustic tile featuring a soft green motif echoing the art deco patterns of the fabrics around. Stepping into the private lanes is like stepping into a luxurious speakeasy club which is a world away from the west London shopping centre location. With dark and moody navy walls and soft pink banquette seating, the central feature bar, with its leather clad face and classic timber detailing is dominant within the space. There are 2 private lanes within this bar and the whole area is designed for groups and corporate bookings to host private parties and events.